Papers from Irina either from her work outside of the sluglab. 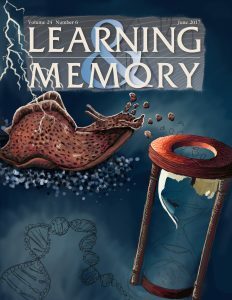 The sluglab has a new preprint out, currently under review at the Neurobiology of Learning and Memory. We shows that both transcription and savings can persist for as long as 2 weeks after the induction of long-term sensitization, way beyond the decay of recall. 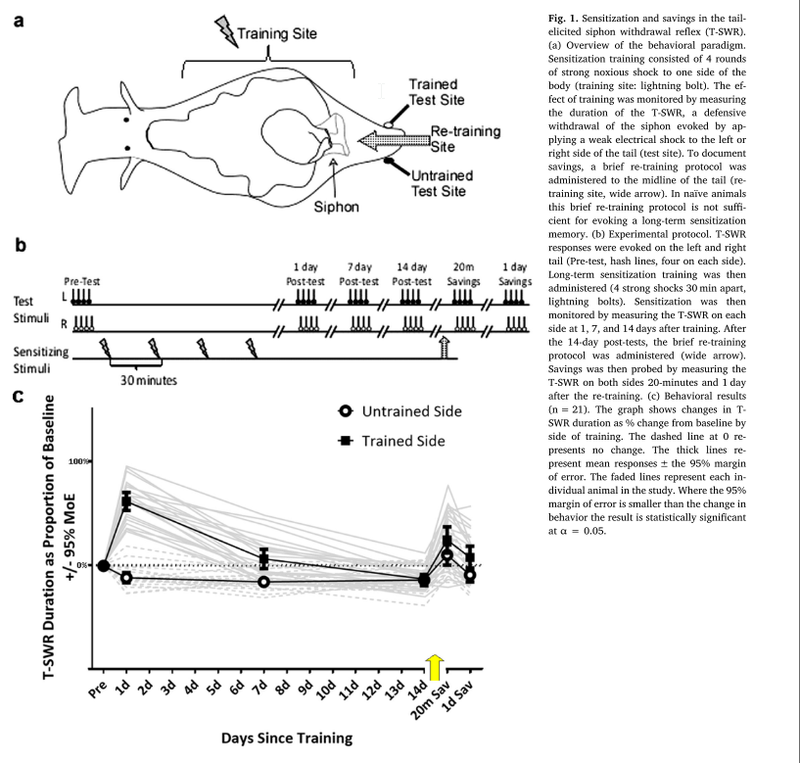 Interestingly, all the long-lasting transcriptional changes start within 1 day of training. Lots of student co-authors on this one; it was a *lot* of work. Looking forward to the reviews. Most long-term memories are ‘forgotten’–meaning that it becomes harder and harder to recall the memory. Psychologists have long known, though, that forgetting is complex, and that fragments of a memory can remain. For example, even after a memory seems forgotten it can be easier to re-learn the same material, something called ‘savin gs memory’. That suggests that there is at least some fragment of a memory that persists in the brain even after it seems forgotten…but what? Today our lab has published a paper shedding a bit of light on this long-standing mystery (Perez, Patel, Rivota, Calin-Jageman, & Calin-Jageman, 2017). We tracked a sensitization memory in our beloved sea slugs. As expected, memories faded–within a week animals had no recall of the prior sensitization. Even more exciting, we found similar fragments of memory at the molecular level–there was a small set of genes very strongly regulated by the original training even though recall had fully decayed. Why? Do these persistent transcriptional changes help keep a remnant of the memory going? Or are they actually doing the work of fully erasing the memory? Or do they serve some other function entirely (or no function at all)? These are some of the exciting questions we now get to investigate. But for now, we have these fascinating foothold into exploring what, exactly, forgetting is all about in the brain. As usual, we are enormously proud of the undergraduate students who helped make this research possible: Leticia Perez, Ushma Patel, and Marissa Rivota. Ushma, who wants to do science illustration, is making an incredible piece of artwork representing these findings. A draft is shown above. She submitted it for the cover of the journal, but sadly they journal selected a different image (boo!). Still, a very exciting and proud day for the slug lab! At this year’s Society for Neuroscience meeting, Irina and I were honored for our contributions to the Faculty for Undergraduate Neuroscience (FUN). Specifically, we were both given the annual Distinguished Service Award. 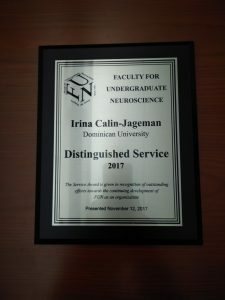 The honors were bestowed for our work organizing the FUN conference this past summer and for other work supporting the mission of undergraduate neuroscience education. We’re so fortunate to be a part of FUN–it’s our favorite people all working towards a mission that is so very important. Thanks for the great honor, and we’re looking forward to staying very involved with FUN. Here’s a photo of Irina’s award. Under the right circumstances, a memory can last a lifetime. Yet at the molecular level the brain is constantly in flux: the typical protein has a half-life of only a few hours to days; for mRNA a half-life of 2 days is considered extraordinarily long. If the important biological molecules in the brain are constantly undergoing decay and renewal, how can memories persist? The Slug Lab has a bit of new light to shed on this issue today. We’ve just published the next in our series of studies elucidating the transcriptional changes that accompany long-term memory for sensitization in Aplysia. In a previous paper, we looked at transcription 1 hour after a memory was induced, a point at which the nervous system is first encoding the memory. We found that there is rapid up-regulation of about 80 transcripts, many of which function as transcription factors (Herdegen, Holmes, Cyriac, Calin-Jageman, & Calin-Jageman, 2014). For the latest paper (Conte et al., 2017), we examined changes 1 day after training, a point when the memory is now being maintained (and will last for another 5 days or so). What we found is pretty amazing. We found that the transcriptional response during maintenance is very complex, involving up-regulation of >700 transcripts and down-regulation of <400 transcripts. Given that there are currently 21,000 gene models in the draft of the Aplysia genome, this means more than 5% of all genes are affected (probably more due to the likelihood of some false negatives and the fact that our microarray doesn’t cover the entire Aplysia genome). That’s a lot of upheaval… what exactly is changing? It was daunting to make sense of such a long list of transcripts, but we noticed some very clear patterns. First, there is regulation influencing growth: an overall up-regulation of transcripts related to producing, packaging, and transporting proteins and a down-regulation of transcripts related to catabolism. Second, we observed lots of changes which could be related to meta-plasticity. Specifically, we observed down regulation in isoforms of PKA, in some serotonin receptors, and in a phosphodiesterase. All of these changes might be expected to limit the ability to induce sensitization, which would be consistent with the BCM rule (once synapses are facilitated, raise the threshold for further facilitation). (Bienenstock, Cooper, & Munro, 1982). One of the very intriguing findings to come out of this study is that the transcriptional changes occuring during encoding are very distinct from those occuring during maintenance. We found only about 20 transcripts regulated during both time points. We think those transcripts might be especially important, as they could play a key regulatory/organizing role that spans from induction through maintenance. One of these transcripts encoded a peptide transmitter called FMRF-amide. This is an inhibitory transmitter, which raises the possibility that as the memory is encoded, inhibitory processes are simultaneously working to limit or even erode the expression of the memory (a form of active forgetting). There are lots of exciting pathways for us to explore from this intriguing data set. We feel confident heading down these paths because a) we used a reasonable sample size for the microarray, and b) we found incredibly strong convergent validity in an independent set of samples using qPCR. This is a big day for the Slug Lab, and a wonderful moment of celebration for the many students who helped bring this project to fruition: Catherine Conte (applying to PT schools), Samantha Herdegen (in pharmacy school), Saman Kamal (in medical school), Jency Patel (about to graduate), Ushma Patel (about to graduate), Leticia Perez (about to graduate), and Marissa Rivota (just graduated). We’re so proud of these students and so fortunate to work with such a talented and fun group. Third paper of the year for the lab (gasp!) is now out in Learning and Memory (10.1101/lm.036970.114). The focus of the project is habituation, considered the simplest and most ancient form of memory. Long-term habituation requires changes in gene expression, but to date there is almost nothing known about what specific changes are required to encode and store a long-term habituation memory. We’re not the first to try to tackle this issue, but it turns out to be a very difficult topic for study. Habituation is typically very site specific, occurring only at the site of training. This implies a relatively discrete set of neurons encode the memory, and that presents a real problem for qPCR and microarray analysis, because the signal from memory-encoding neurons could easily be washed out from signal from non-encoding neurons, glia, etc. Our strategy was to develop a new, automated protocol for inducing long-term habituation over the entire body of an Aplysia. With the help of a tinker-toy set, a windshield-wiper motor, a relay box, an old computer with a parallel port, and some qBASIC programming (blast from the bast), we developed a slug car wash–an apparatus we could place over the tanks to repeatedly (though gently) brush Aplysia without any need for human intervention during training. We made a video to show off the system, which you can see here. The slug car wash turns out to work great. We tracked the development of habituation over repeated rounds of training and saw a classic pattern of behavior–robust decreases in behavior at the end of each round of training, substantial overnight recovery (forgetting), but a progressive development of a persistently decreased response within 3 days of training. Importantly, we could observe habituated responding when stimulating the animal at the head, the siphon, or the tail. Moreover, the effect sizes were huge. So it was pretty clear that the slug car wash was producing the high impact we were looking for. In addition, we found that pattern of training really does matter–when training has breaks between sessions and is spaced out over 3 days it is extremely effective; massing all the same stimulation together into a single one-day session (at a slightly higher rate to squeeze it all in) produced neither long-term nor short-term habituation. This is a useful finding because it gave us an additional no-memory control, one which could ensure any molecular correlates identified are specific to memory formation, not just to the activity induced by brushing. So what’s changing transcriptionally? We decided to focus on the pleural ganglia containing the VC nociceptors. These are relatively high-threshold neurons, and are probably not carrying the bulk of the activity induced by the brush. Unfortunately, though, no one yet knows *where* in the Aplysia nervous system to find the cell bodies of the low-threshold neurons that mediate light touch (probably in the periphery). Not to worry, though–we did record from the VCs in reduced preps and found that they do actually get some activation from the brush: about 1/4 fired APs, and most of the rest got lots of IPSPs from off-center stimulation. To track transcriptional changes, we used the custom-designed microarray we recently developed in the lab (25117657). Some quick words about methods: We again used a large-ish sample size (n=8/group; can you believe that n=3/group is still common in microarray!?). We also used very high statistical standards by adopting the ‘treat’ function in limma which allows you to specify a reasonable null hypothesis (e.g. at least 10% regulation in either direction, rather than the standard practice of testing against a null of no regulation). Adopting a more reasonable null enables you to test for statistical and practical significance at the same time, and we’ve found that transcripts which pass such a rigorous test generalize very well to new samples. We’ve been finding R and limma surprisingly easy to use, which is pretty fantastic for free software. Anyways, back to the data. The microarray results were a bit of a bummer. Out of over 20,000 transcripts tested, only *one* came up as strongly regulated. Bummer. Another 20 transcripts came up as regulated if you use a standard null hypothesis, but, as expected, none of these validated. Although the microarray results were not what we hoped, we did further explore the one regulated transcript, and it turns out to be quite interesting. From sequence alignment, it seems to be an Aplysia homolog of cornichon, an auxiliary subunit for AMPA receptors. In invertebrates, cornichon seems to limit trafficking to AMPA receptors to the membrane and therefore reduces glugatmate-induced currents(24094107). Note that this is precisely the type of effect that could produce behavioral habituation. Moreover, one of the few known molecular correlates of long-term habituation is a decrease in surface expression of glutamate receptors (14573539). Fits perfectly! To ensure that cornichon is truly regulated in our paradigm, we did some additional follow-ups. First, we used qPCR to check cornichon levels not only in the microarray samples but in an additional, independent set of samples. Sure enough, we confirmed up-regulation of cornichon in the pleural ganglia 1 day after training. In addition, we checked levels in massed animals, who display no memory after training. In this case, cornichon was actually slightly down, and was significantly different than in the regularly trained animals. So, cornichon is quite specifically and consistently up-regulated after long-term habituation training. As far as we know, this is the first specific transcriptional correlate of long-term habituation to be identified. Needless to say, we’re quite proud of this work. 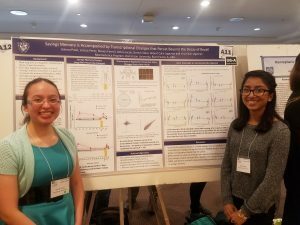 It wouldn’t have been possible without two of the most talented undergrads we’ve had in the lab: Geraldine Holmes and Samantha (Sami) Herdegen. Geraldine was the most diligent slug trainer in the history of the lab. For this paper alone she ran over 48 animals, testing each 8 times a day for 3-5 days–that’s a whole lot of behavior to monitor! Sami, of course, has been the qPCR wizard in the lab, testing lots and lots and lots and lots of transcripts for regulation. It’s no surprise that both are on to bigger and better things, Geraldine is now in a PhD program in Canada and Sami is soon to start pharmacy school. We also had contributions from John Schuon (when he could fight his way in for some qPCR; now off to medical school), Ashly Cyriac (who helped start the project before heading off to pharmacy school), Jamie Lass and Catherine Conte. Congrats! As has now become the norm for the lab, all the raw data from this study been posted online at the Open Science Framework: https://osf.io/6ew4i/. We show that some transcriptional changes are likely occuring in interneurons and motor neurons, not just in the VC nociceptive sensory neurons. We were able to better test the notion that CREB supports memory maintenance. So far, our evidence continues to go against this hypothesis, with no long-lasting changes detected in the VC sensory neurons nor in the pedal ganglia. As a methodological point, we found that microdissecting out the VC cluster really really improves signal:noise for identifying transcriptional changes induced by learning. This is exciting–most work on the molecular mechanisms of memory uses tissue samples representing homogenous cell types. Zooming in on a single cell type of known relevance for storing the memory really enhances the power of the analysis. We re-rested the four novel transcripts identified in our microarray paper from earlier this year (25117657). All four validated again! Moreover, all 4 were specifically up-regulated in the VC nociceptors (and some elsewhere as well). Another good indication that we’re on the right track with our microarray approach. Another 3 student co-authors on this paper! We’re especially proud of Sami, Catherine, and Saman. The paper is free on PLOSE ONE: http://dx.plos.org/10.1371/journal.pone.0114481. Also, you can download our raw data to examine for yourself at the Open Science Framework: https://osf.io/ts9ea/. We’ve got a new paper out (25117657) with the first of what we hope will be a series of studies using microarray to track the transcriptional changes following long-term sensitization training. 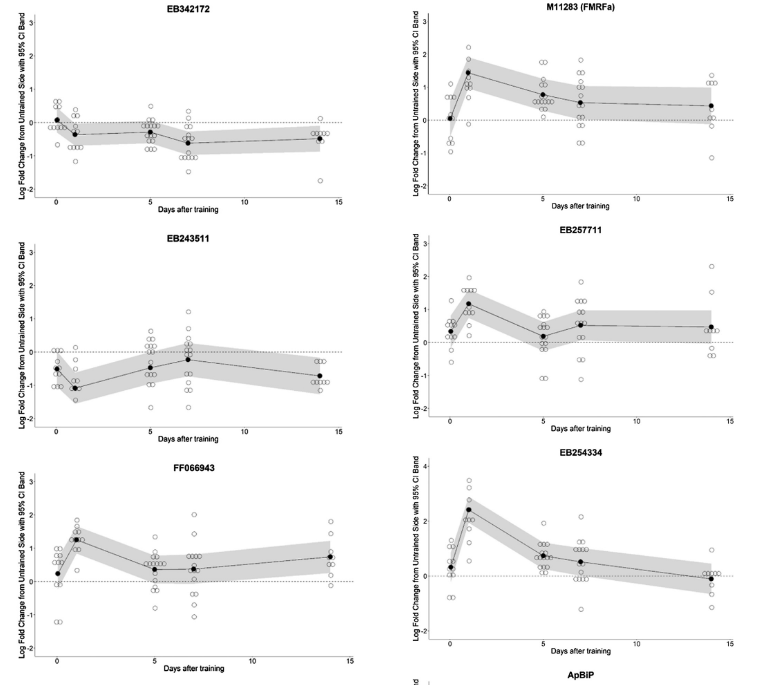 This paper looks at the changes that occur immediately (1 hour) after training. It provides lots of details and data to validate the microarray design we developed, but also identifies a set of 81 transcripts that are strongly regulated after learning. Best of all, for a microarray paper, we use a large sample size (n = 8) and show using a subset of transcripts that most generalize to a completely independent sample. Among the changes we fully validated are up-regulation of a c/ebp-gamma (what the what!? ), a glycine transporter, and a subunit of ESCRTII. The rest of the gene list that we’re working on has some exciting possibilities, too. Another thing to be proud of, is our three student co-authors on the paper. The paper is free for the next 50 days via this link, then it goes behind a paywall for 305 days, then it will be in PubMedCentral for free again (strange, right?). All the raw data is available on the Open Science Framework: https://osf.io/8pgfh/. Cav1.3 channels mediate Ca(2+) influx that triggers exocytosis of glutamate at cochlear inner hair cell (IHC) synapses. Harmonin is a PDZ-domain-containing protein that interacts with the C-terminus of the Cav1.3 α1 subunit (α11.3) and controls cell surface Cav1.3 levels by promoting ubiquitin-dependent proteosomal degradation. However, PDZ-domain-containing proteins have diverse functions and regulate other Cav1.3 properties, which could collectively influence presynaptic transmitter release. Here, we report that harmonin binding to the α11.3 distal C-terminus (dCT) enhances voltage-dependent facilitation (VDF) of Cav1.3 currents both in transfected HEK293T cells and in mouse inner hair cells. In HEK293T cells, this effect of harmonin was greater for Cav1.3 channels containing the auxiliary Cav β1 than with the β2 auxiliary subunit. Cav1.3 channels lacking the α11.3 dCT were insensitive to harmonin modulation. Moreover, the ‘deaf-circler’ dfcr mutant form of harmonin, which does not interact with the α11.3 dCT, did not promote VDF. In mature IHCs from mice expressing the dfcr harmonin mutant, Cav1.3 VDF was less than in control IHCs. This difference was not observed between control and dfcr IHCs prior to hearing onset. Membrane capacitance recordings from dfcr IHCs revealed a role for harmonin in synchronous exocytosis and in increasing the efficiency of Ca(2+) influx for triggering exocytosis. Collectively, our results indicate a multifaceted presynaptic role of harmonin in IHCs in regulating Cav1.3 Ca(2+) channels and exocytosis.